In 1820 William Bracegirdle, a local fisherman with interests in boat related businesses, was residing in Bennett Street (now Hoskins Street). In 1826 he took out a yearly tenancy on Ballast Wharf. It was in a very dilapidated condition and a surveyor’s report of 1828 considered it “not only very bad but also in a dangerous state as regards the safety of persons passing over the Quay”. It was impassable to carts and the wharf itself was little more than a beach, down river from Millington’s Anchor Iron Wharf, on which fishing smacks were laid up and boat repair materials were stored. George Hoskins was a boat builder at Crowley’s Wharf and Ballast Quay in the 1820s, after he had learned his trade from his father, Workman Hoskins in his boat building business at Wood Wharf in West Greenwich. In 1838 he rented a wharf and warehouse on Ballast Quay from William Bracegirdle. After Bracegirdle took out a 21 year lease on the large property known as Thames Cottage in 1840, Hoskins took up residence there too together with his family, possibly carrying on a joint business venture. 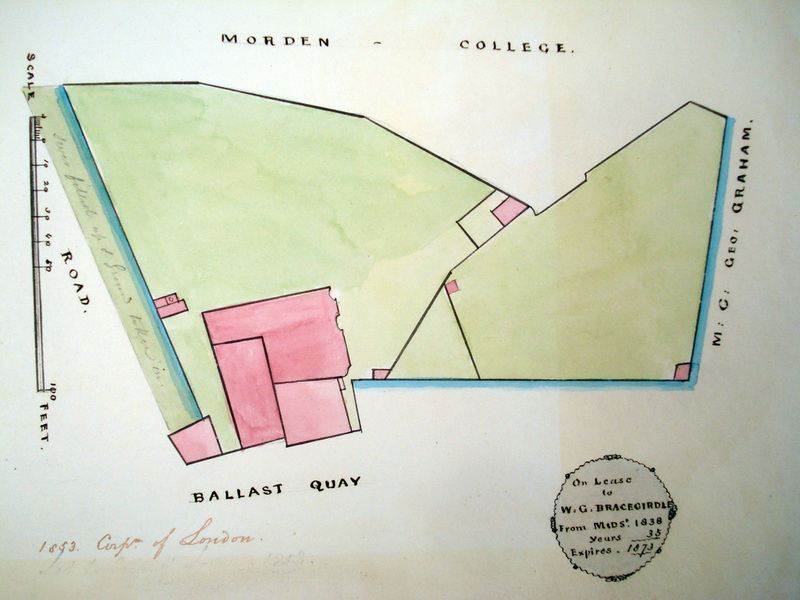 In 1829, in consequence of the dilapidated state of the wharf at Ballast Quay, Morden College commissioned a report and plan for the rebuilding, enlargement and extension of the wharf into the river by between 30 and 60 feet. 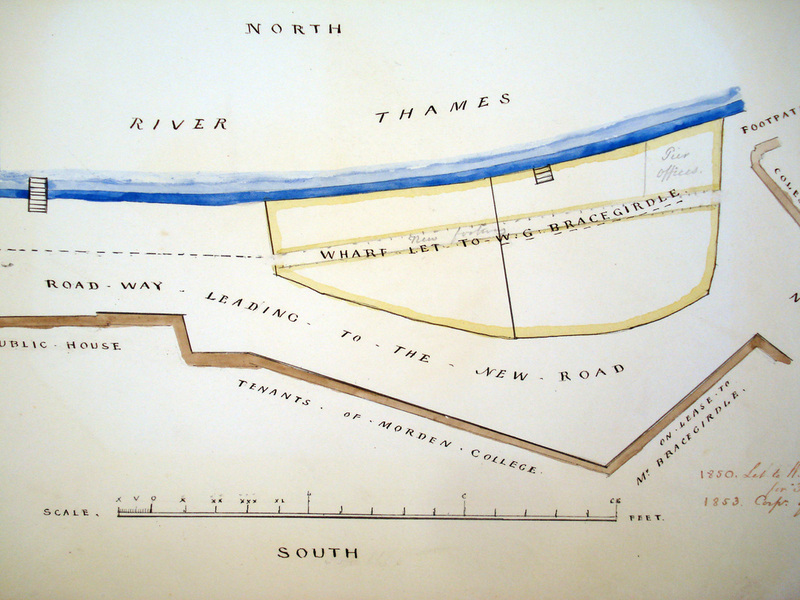 The plan shows the line of the proposed new river wall superimposed over the then existing shape. The expense of carrying out the plan was an issue and little but essential repairs happened until 1838, when George Smith, Morden College’s surveyor, again advised that complete rebuilding in a continuous straight line was required. The work was finally completed in 1840. In 1840 Bracegirdle had also been granted a lease for 7 years of “a messuage & garden at the Ballast Wharf" by Morden College at £25 a year, in return for erecting fencing to enclose the newly refurbished wharf, building a landing slipway for boats and carrying out repairs to the dilapidated road surface, about which tenants complained. In 1841, at the request of Morden College, Bracegirdle also erected a bar with posts and rails across the entrance to Ballast Quay at Marlborough Street (now Lassell Street). He was paid 10 shillings a quarter to open and close it and collect a toll from non-tenants. The fence and the bar effectively cut off the ancient public right of way along the Thames across Ballast Wharf. 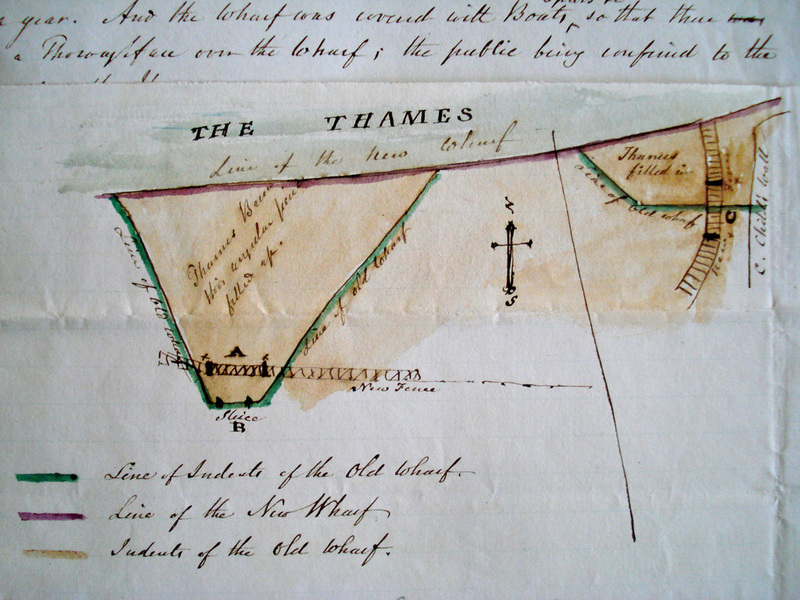 Hand-drawn map of the wharf showing its state before and after the realignment by Morden College. It also shows the position of the fence that Bracegirdle erected on behalf of Morden College to enclose the Wharf. This was controversial and proved costly to him personally when he pursued a court case against the Parish of Greenwich for trespass on the Wharf, because the fence had been constantly vandalised by the Parish in order to maintain a public right of way across the Wharf. The positions where the fence was sawn through and removed are marked A and C, as is the wall built by Coles Child to enclose his Greenwich Wharf. This became the subject of a costly court case in 1844, when William Bracegirdle sued the Superintendent of Highways of the Parish of Greenwich, who had over time caused damage to the fence in order to keep open the public right of way. The Court of Assizes at Maidstone found that the Parish had been guilty of trespass, but upheld the public right to a 5 foot wide right of way across the wharf. The financial loss incurred in this court action was a severe blow to William Bracegirdle, at a time when the fishing industry in Greenwich was facing a huge challenge from the opening of the new fishing port of Grimsby and the advent of fast railway connections to coastal ports. construction of the East Greenwich Steam Boat Pier in partnership with William Coles Child in 1845-46. It was not a success and caused him to become insolvent through having to mortgage his lease on Thames Cottage in order to raise his share of the finance for the project. The failure of this last enterprise forced him to give up his lease on Thames Cottage and move to new premises in 1849, finally ending his days in the Queen Elizabeth Almshouses in Greenwich. When Thames Cottage was finally sold at auction in 1854 it was listed as a spacious residence, together with boat-builders’ and sail-makers’ premises, opposite the Steam Boat Pier in East Greenwich. Following the sale it was demolished and new offices for the Harbour Master were erected in 1855 by the Thames Conservancy to regulate the trade in coal, which had grown massively in order to fuel London’s industry. The Harbour Master’s Office today occupies that site on the corner of Ballast Quay and Pelton Road where once Thames Cottage stood. Plan attached to the lease on Thames Cottage, Ballast Quay, granted to William Bracegirdle, with its four sections, large garden and gazebo. It was described as a weatherboarded brick building with a ground floor and first floor, and was large enough to accommodate several families. It also had boat-builders’ and sail-makers’ premises, probably the reason why George Hoskins decided to move there too. Bracegirdle and his family resided here until his financial circumstances forced him to surrender the lease in 1849. A plan of the newly aligned Wharf which Bracegirdle leased in 1840. 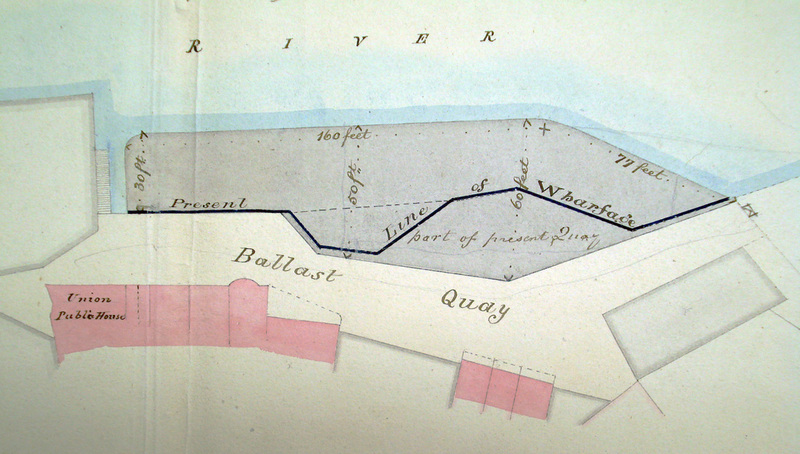 Interesting later additions in pencil show the agreed line of the new footpath through the middle of the wharf, as a result of the court case contested by him in 1844, and the position of the Office for the Steam Boat Pier built in 1846. 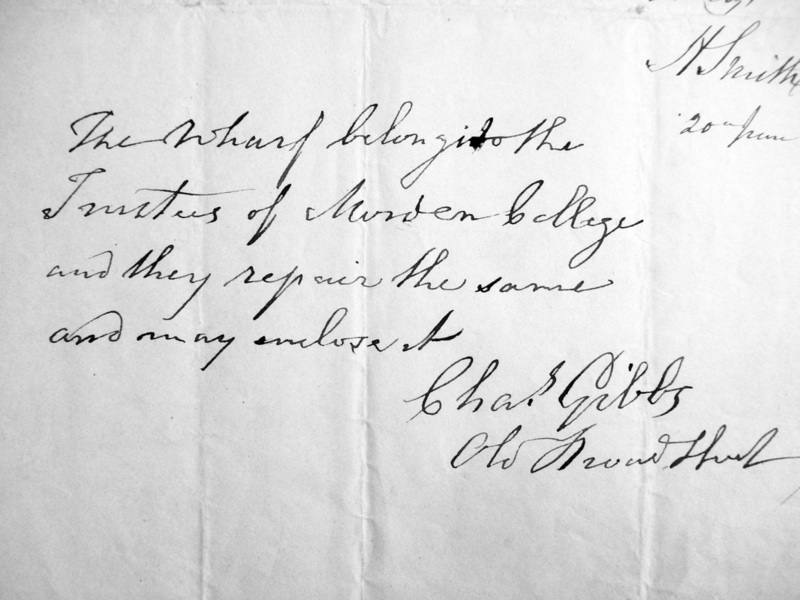 The legal advice given to Morden College by solicitor Charles Gibbs confirming the right to enclose the newly refurbished Ballast Wharf. This opinion gave strength to Bracegirdle’s and Morden College’s case against the Parish of Greenwich for acts of trespass, which resulted in the public right to a footpath across the Wharf being upheld by the court. William Bracegirdle was never adequately compensated for having acted in Morden College’s interest in the matter, which contributed to his worsening financial situation. Sold as architectural salvage material prior to its demolition in 1854. The amount and detailed description of the sale items gives some idea of the size of the property, of which no contemporary photograph has so far come to light. The Thames Conservancy built the Harbour Master’s Office on the site in 1855.